Swan Draught began life in 1857, when Frederick Sherwood established a new brewery by the Swan River in Perth, Western Australia. It has gone from strength to strength since those early days, and enjoys a fierce rivalry for the affection of Western Australians with Emu Bitter. 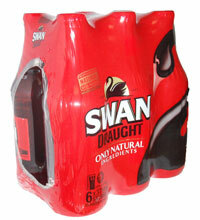 Swan Draught is a bitter lager which pours a straw gold colour, with a light malty aroma. A relatively clean tasting lager, it has light, biscuity, malty notes, followed by a refreshing finish with just a hint of hoppy bitterness. Enjoy cold. very good, nice taste, swan's 1st!!! !